Sandra Day O'Connor in a 1950 Stanford University yearbook photo and William Rehnquist in a 1948 Stanford University yearbook photo. Some personal secrets are so well-kept that even family and friends are oblivious. So it is with the story of the late Chief Justice William Rehnquist's marriage proposal to a Stanford Law School classmate in the early 1950s. 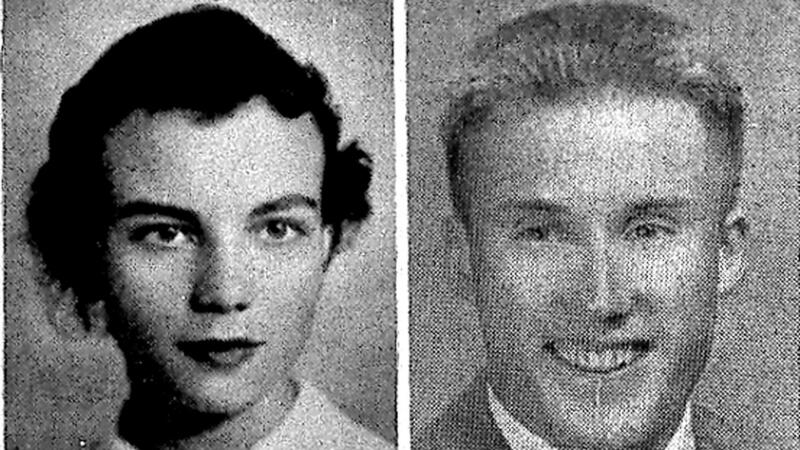 When 19-year-old Sandra Day entered Stanford Law School in 1949, her frequent seatmate was 26-year-old Bill Rehnquist, attending Stanford on the GI Bill. The two shared their equally meticulous class notes and eventually were dating regularly. But by December of their second year, she broke up with him while somehow retaining what she called their "study buddy" relationship; she even entered the moot-court competition with Rehnquist, and the pair finished second. When Rehnquist graduated a semester early and went off to Washington, D.C., for a Supreme Court clerkship, Sandra wrote to her parents that school "does not seem the same" without him. "We all truly hated to see him leave, in spite of, perhaps, even because of, all the funny things he does. He certainly has a brilliant career ahead," she added. 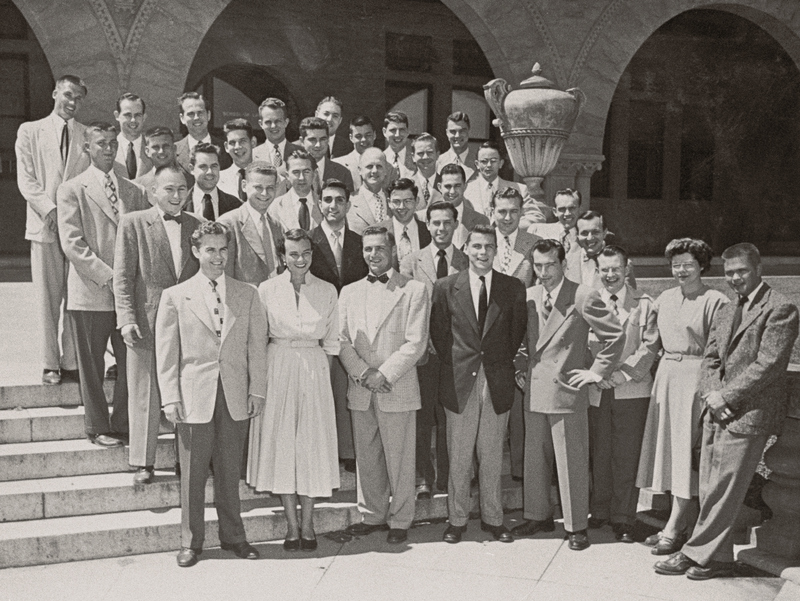 O'Connor (first row, second from left) and Rehnquist (back row, furthest left) pose for a class photo for the Stanford Law Review's board of editors (1950-51). By then, Sandra was dating John O'Connor, whom she met over a proofreading assignment on the prestigious Stanford Law Review. After their first meeting, John suggested they finish their proofreading over a beer, and the two soon were inseparable. John was charming and funny, and unlike a couple of beaus who had jilted her, he was not cowed by her smarts. But in March, just about the time that Day and O'Connor were going out on their 40th date in 40 days, Sandra got a letter from Rehnquist telling her he wanted to see her to talk about "important things." And in a March 29 letter, he popped the question. "To be specific, Sandy, will you marry me this summer?" The future chief justice of the United States was proposing to the woman who, years later, would become the first woman to serve on the nation's highest court. The reveal comes in a new book entitled First by author Evan Thomas, set to be published in March 2019. Thomas, while doing his research, found the Rehnquist letters among O'Connor's correspondence. Sandra Day would marry John O'Connor, becoming Sandra Day O'Connor in 1952. As for Rehnquist, not long after Sandra said "no," he would start dating Nan Cornell, the woman he would marry in 1953. According to Thomas, Rehnquist would tell a friend shortly before his death in 2005 that Nan, who died in 1991, was the only woman he ever loved. 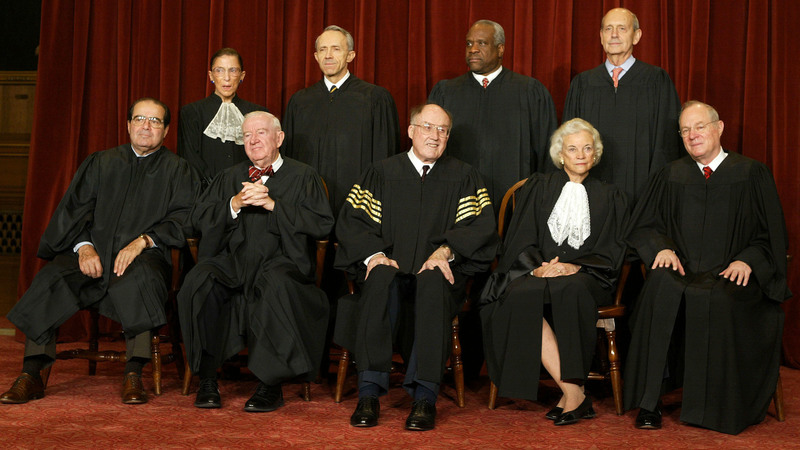 O'Connor and Rehnquist are pictured with the other Supreme Court justices for a photo in 2003. The two justices never made a secret of their dating relationship at Stanford, though both played it down. But it appears that neither friends, colleagues nor family knew of the marriage proposal — until now. O'Connor's son, Jay, says that he and his siblings were "surprised," though they knew their mother and Rehnquist had dated. That, observes Jay, "was a different era." "Dating was pretty innocent in the '50s," he says, adding that "multiple men proposed to my mom when she was in college and law school, and ultimately my dad was the one who was the real deal." Most remarkable was that O'Connor and Rehnquist remained close personal friends. They both ended up living in Phoenix, socialized together often and even were neighbors, according to Jay. And when Rehnquist went to Washington in the Nixon administration and was later appointed to the Supreme Court, the two stayed in touch. Indeed, Rehnquist is said to have been one of those who privately suggested O'Connor to President Reagan as a potential Supreme Court nominee in 1981. "It was just an amazing accident of history that ... my mom and her friend and law school classmate ended up on the Supreme Court together," Jay says. "Not only did they have a wonderful working relationship for over 25 years on the court, they had a wonderful friendship their entire life." Some secrets are so well-kept that even family members don't know them. So it is with the story of two Supreme Court justices and a proposal of marriage. NPR legal affairs correspondent Nina Totenberg has the story. NINA TOTENBERG, BYLINE: When 19-year-old Sandra Day entered Stanford Law School in 1949, her frequent seatmate was 26-year-old Bill Rehnquist. The two were soon dating regularly, but by December of their second year, she broke up with him, while somehow retaining what she called their study buddy friendship. By 1952, Sandra, the only woman in her class, was dating another Stanford student, John O'Connor, and she was smitten. But in March, she got a letter from Rehnquist, who had graduated early and was in Washington, D.C. He wanted to see her to talk about, quote, "important things. To be specific, Sandy, will you marry me this summer?" The future chief justice of the United States was proposing to the woman who, years later, would become the first woman to serve on the nation's highest court. The proposal is disclosed in a new book, called "First," by author Evan Thomas, to be published in March. Sandra Day would marry John O'Connor, becoming Sandra Day O'Connor in 1952. As for Rehnquist, not long after Sandra said no, he would start dating Nan Cornell, the woman he would marry in 1953. According to author Thomas, Rehnquist would tell a friend shortly before his death that Nan, who died 14 years earlier, was the only woman he ever loved. It appears that even the Rehnquist and O'Connor children did not know about the marriage proposal. O'Connor's son, Jay, says he and his siblings were surprised by the news. Though, as Jay observes, dating in the 1950s was pretty innocent. JAY O'CONNOR: Multiple men proposed to my mom when she was in college and law school, and ultimately my dad was the one who was the real deal. TOTENBERG: Most remarkable was that O'Connor and Rehnquist remained close personal friends forever. They both ended up living in Phoenix, socialized together often and stayed in touch even after Rehnquist's appointment to the court. Indeed, he was said to have suggested O'Connor's name to President Reagan for a potential appointment to the court in 1981. Jay O'Connor. O'CONNOR: It was just an amazing accident of history that my mom and her friend and law school classmate ended up on the Supreme Court together. Not only did they have a wonderful working relationship for over 25 years on the court, they had a wonderful friendship their entire life. TOTENBERG: Nina Totenberg, NPR News, Washington. Transcript provided by NPR, Copyright NPR.